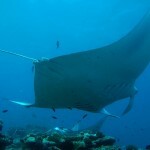 With the help of Manta Trust we were able to ID the manta we encountered, which is known as Salsa (MV-MA-0069). Salsa is a mature female manta that was first identified in November 2004 at Lankan Beyru, North Male. She is quite the ‘show off’ and has been sighted a total of 122 times, all of which have been recorded in North Male Atoll. This beautiful female has been recorded to be pregnant three times since Manta trust first documented her in their system, once in 2006, again in 2009, and more recently in November 2016. She was believed to have been in her third trimester when last seen in November 2016. It looks like there might be a little Salsa Junior in our midst…as Salsa seems to have given birth and is no longer sporting the large baby bump. As we were in the Easter holiday time we had lots of Kids 8 & 9 years old doing Bubblemaker program. On the 22nd of April was Earth Day and we successfully cleaned our house reef and lagoon with the help of our guests and the Hotel Staff. We would like to Introduce our New Toy! A revolutionary multi-user diving system that supplies air from the surface. The safest, easiest, most comfortable and versatile. The PETER Diving system uses compressed air tanks like a SCUBA system but utilizes long air lines that allow the tanks to remain on the surface while the diver explores the world below the waves. Without the need for buoyancy control devices and with the safety that comes from being attached to a floating object on the surface. PETER Diving System is simple and ideal for first-time divers as young as 8 years, also suitable for the elderly and handicapped. Even if you are an experienced snorkeler or diver, you will be surprised of the feeling of freedom & comfort when diving without tanks on your back. We also would like to introduce our new Instructor joining the team.